We've lost a member of our family...literally! Luckily it is one that is not so cuddly... (no, not Gavin). 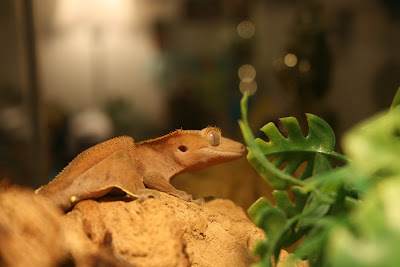 If you are gonna have a reptile, this was the one to have. It can go for a week without eating. It has webbed feet so it would climb all over everything. Kids can hold it, pet it, and it will jump all over the place. And it will camouflage itself. The lid was accidentally left open at the last feeding and now there is no sign of the little guy. It could currently be residing in Amigo (the cat's) tummy. It could be roaming the house, finally free of his cage. It could be smushed in a drawer, rotting away. I am really hoping for scenario #1, or #2. I do not want to find gecko guts when I least expect them. If you are over and you see a little green or brown or orange or yellow lizard looking at you, will you grab him? Don't worry about him loosing his tail. He already lost it the last time the cat gave him a good scare. Honestly- how do you sleep at night with it loose?? I realize it probably won't lick your eyes when you are sleeping but does it kind of creep you out??? I remember catching lizards at Lake Powell when we were little and we hid them in our shoes from my mom so we could get them home. Of course we lost them in our house the first week. I remember finding them a year later when my mom made us deep clean our room and their bodies were rotting into the carpet behind the dresser. Check behind the dresser!!! If you need a place to sleep until you find them you are always welcome at our house. I am a terrible mom. We don't have any pets. there are geckos EVERYWHERE in our backyard. they make the scariest noise and they look just like poor gecky. ill bet dalton is devistated! there are babies and big ones and they invade our back patio every night. they are VERY hard to catch. Good Luck! update please - did you find him? He has been found. We tore the house apart. I had nightmares that I would find a half eaten lizard in the cat bowl. But he must have gotten hungry, because we found him in Dalton's room, a few days later, close to his cage. He is residing happily, back where all the other wild things are. He almost had a heart attack the other day, at Shelby's birthday party, when he got passed around by ten four year old girls.